If you know anything about the sushi world in around here, you’ve probably heard of Hidekazu Tojo. He’s kind of a big dill (food pun!) around here, or at least he was before sushi became just as ubiquitous as burgers and fries. In a way, Tojo popularized sushi. Funnily enough, I randomly met him once when I used to work an office job. One of my duties was to pre-screen clients. There was a standard set of questions we went through and one of them was, “Are you [insert name on application]?” When I asked Hidekazu, he answered, in a very affirmative voice, “I’m Tojo!” I was kind of confused because the way he said it implied that I should have known who he was – and the thing is, I did because in a strange twist of fate, I had eaten at his restaurant a week or two earlier – but as a random office worker, how would I know? Maybe I was misinterpreting. Anyway, his claim to fame is that he invented the California roll. California rolls (and cones) aren’t something I typically get when out for sushi, but as a kid, they used to be my go-to order. 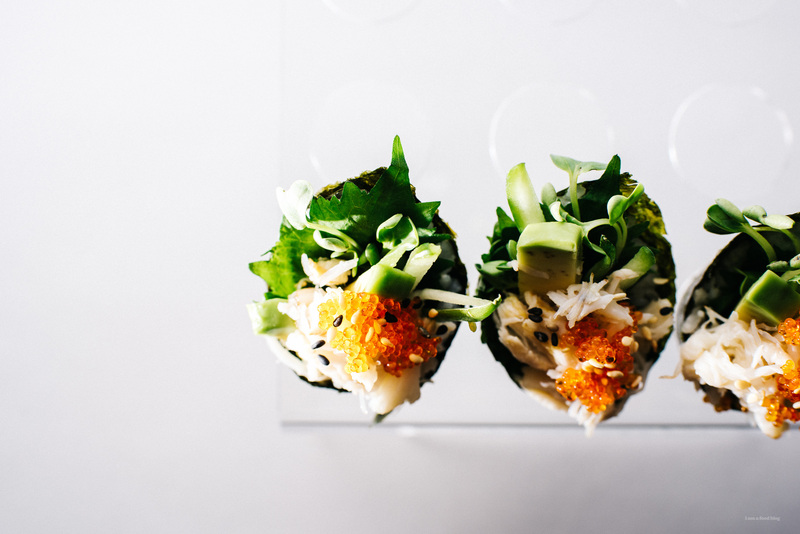 Crab and avocado happens to be one of my favorite flavor combos and at its core, that’s what a California roll is. Sometimes I forget how perfect vinegary sushi rice, creamy avocado, fresh crab, and kewpie mayo go together. I like to think of California rolls as the gateway sushi of choice – they’re non-threatening, delicious, and once you’re hooked on them, it’s easy to move on to trying other more interesting/authentic combinations. Speaking of authenticity, the funny thing about California rolls is that they’re not at all traditional. When I think about it, I’ve never once saw them when Mike and I lived in Japan. I’m not sure if that’s because the idea is completely foreign or because they don’t have a lot of avocados. I’m thinking it’s a combination of the two. The closest I’ve seen is a crab meat roll, and to be honest, that wasn’t even an inside-out roll. The inside-out characteristic of a California roll is completely American. 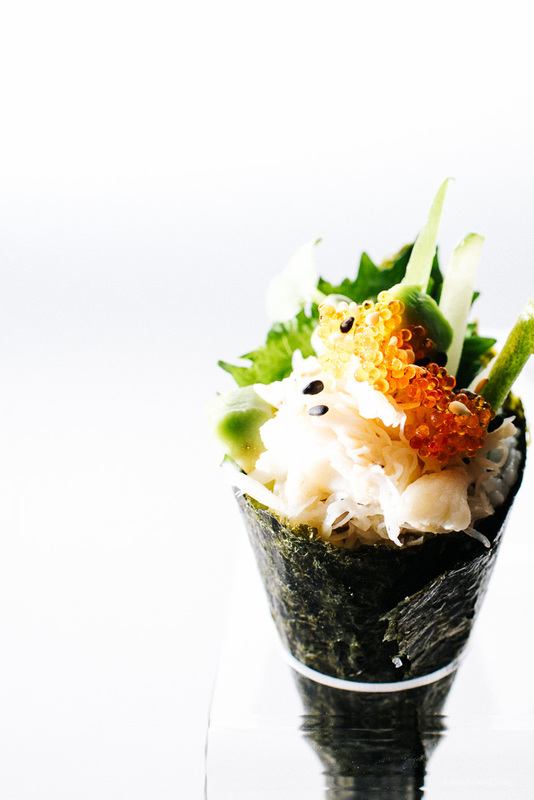 According to wiki, seaweed was put on the inside of the roll because the color of nori was off putting. Funny because now roasted nori is a (kinda?) common snack in the States. There’s actually a little controversy surrounding who created the California roll. Tojo says he’s the one, but there’s another sushi chef, based out of LA claims to be the inventor. To be honest, I’m leaning towards the LA based chef, because, um, he’s actually Californian. Origin story aside, there’s another controversy about California rolls, that that has to do with their reputation as fake sushi. I think it has to do with the fact that there’s a huge difference between a good California roll and a bad one. It has everything to do with the crab. The handy thing is, you can easily identify bad California rolls: they’re made with fake crab. Sometimes they don’t even bother shredding the crab sticks – that’s when you know it’s going to be really bad. If your roll has freshly picked crab in it, you’re probably in good hands. If you’re picky about it, the way I am, you can make your rolls or cones at home. Sure, it takes a long time to buy a crab, steam it, crack it and pick through, but the result is so, so worth it. And, if you’re not feeling buying live crab, you can find tubs of freshly picked crab at the market, fishmonger, or Japanese market in the fish section. I hope you get a chance to make these guys. They’re incredibly addictive. 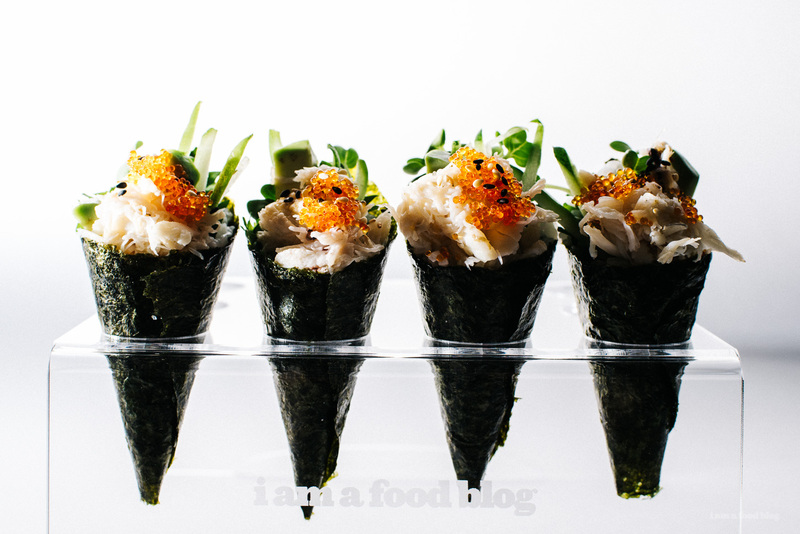 I love the salty pop of the tobiko, the textural contrast of the nori and rice, and the creaminess of the avocado next to the crab. 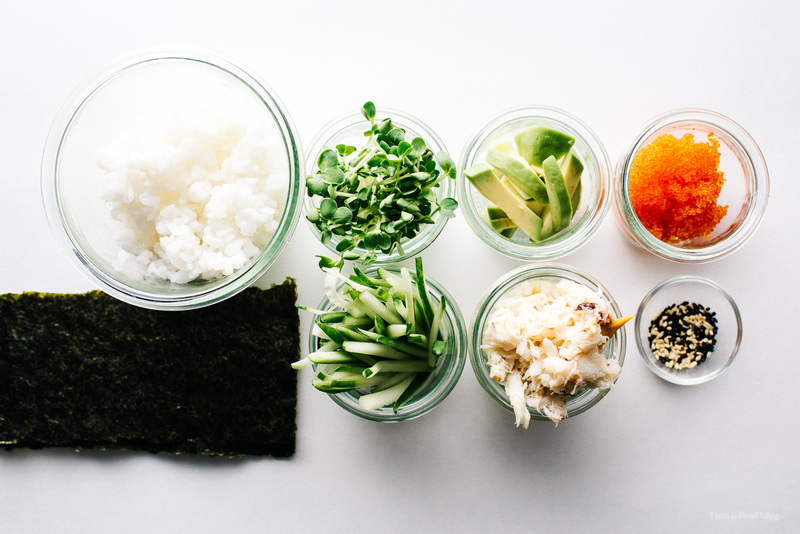 California rolls are popular for a reason: when they’re made right, they’re really, really good! 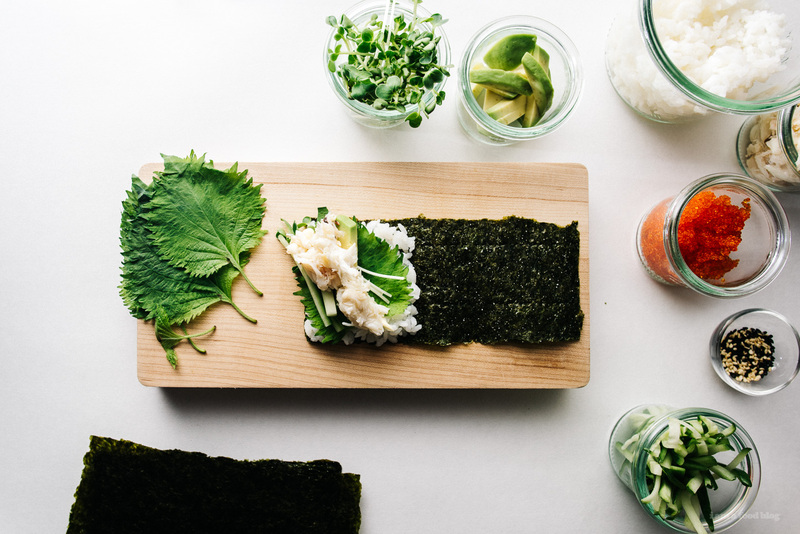 Cut the nori sheets equally into 3 so you end up with 6 rectangular sheets. Lay the sheets out, shiny side down. Press about 1-2 tablespoons of sushi rice onto the left side of the nori. The rice should be in a rough square shape. Place a leaf of shiso down, on the bias/diagonally. Top with a couple of shreds of cucumber, a slice of avocado, a bit of crab, and a squeeze of kewpie mayo. 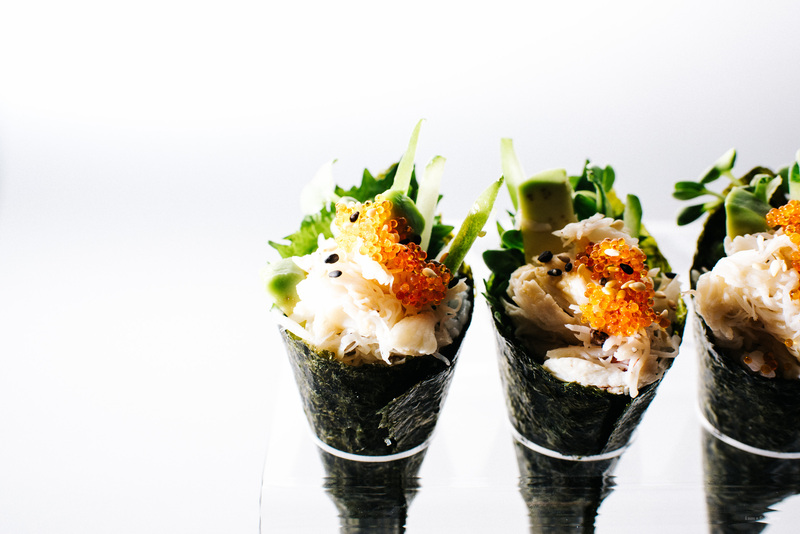 Fold up the bottom left hand corner of the nori, pulling it towards the top edge of the nori, forming a cone. 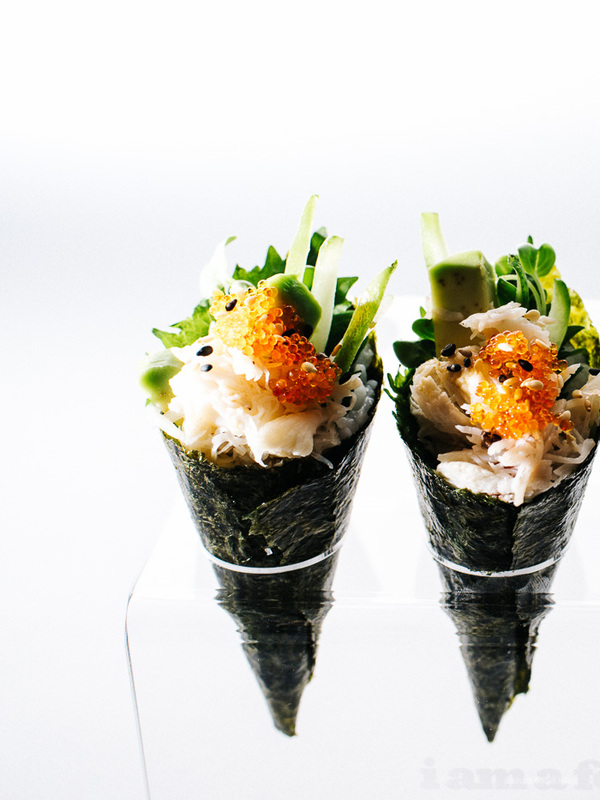 Continue until the nori is rolled into a cone shape. 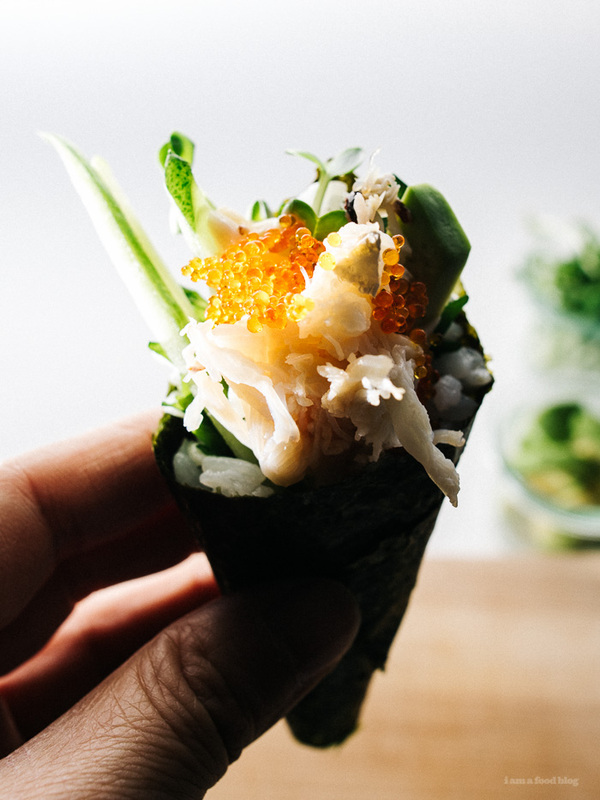 Use a grain of rice on the bottom right hand corner to help stick the nori to itself. Top with tobiko and toasted sesame seeds. Enjoy with wasabi, soy and ginger! Place the sushi rice in a colander, rinse throughly and let drain for 15 minutes. Cook according to the package instructions. I usually cook my rice in a rice cooker, but when I’m in a kitchen that doesn’t have a rice cooker, a pot on the stove works equally well. While the rice is cooking, combine the rice vinegar, sugar, and salt in a small sauce pan and warm over medium-low heat until the sugar dissolves. When the rice is done cooking, transfer to a very large bowl. Sprinkle on half of the vinegar mixture and use a rice paddle or spatula to mix the vinegar into the rice while using a slicing motion. Fan the rice while mixing to dry it out slightly – it helps if you have a friend to fan while you mix. Taste and adjust the seasoning, adding more if needed. Cover with a damp towel until ready to use. I would like to eat about a dozen of these. Right now. Lol at the distasteful color or nori haha. These would look so cute for a party! Also that personalized acrylic stand. woo! These are the prettiest mini cali cones I’ve ever seen. I don’t usually order them either, but if you’re rolling some, I’ll def have a few! Where did you get the cone holder? It’s interesting to me that for you a ‘proper’ California roll is with real crab! I’m from California and grew up on delicious California rolls made with fish sticks–the fact that it’s made with fish sticks makes it “authentic” for me. :) Of course, I won’t say no to real crab either! These california cones are so cute! And how cool that you met Tojo! Those are neat, I love the unique presentation. Not to mention that sushi is fantastic even when it’s ugly, so these should be amazing! Those hand rolls look great. When California roll is actually made with real crab meat it can be pretty amazing. If you ever have the chance to try sushi at any of the Morimoto restaurants just go all out, everything is delicious. One of my BIGGEST pet peeves is asking someone if they like sushi and them saying “well I like California rolls.” BUT you make me love California rolls or cones in this case ha. Definitely has a lot to do with you using fresh crab. Can’t knock that! Literally laughed out lous when you were talking about the places with the straight up crab sticks in their rolls. Nooo. 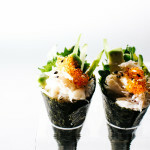 These cones are such a cute date night/diy sushi night idea! just need to figure out where i can get some of those standards, were i can put the cones in.